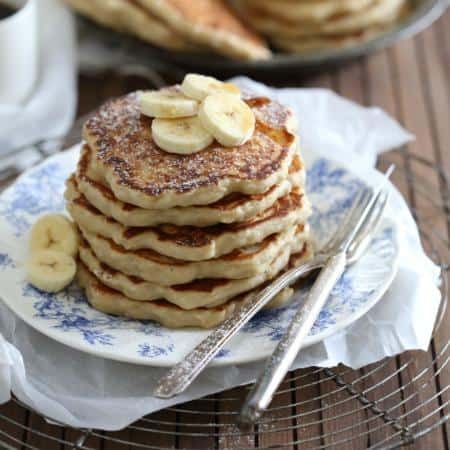 These banana nutmeg pancakes are made from scratch with yeast. Just 10 minutes of rising time makes these the fluffiest pancakes you’ll ever eat. Something absolutely crazy happened last week, I’ve officially been with Ulysses for more than half my life. We started dating when I was 16 and as of the 11th, it’s been 16 years since our first date (to see A Bug’s Life if you’re wondering). Fast forward about 7 years from that first date (that I can still vividly remember snapping the cap of a Snapple bottle in the car after the movie) and we were trying to pick our first dance song for our wedding. I hated wedding planning with a passion. I was never one of those girls that had everything imagined perfectly in my head, my fiance was 1,500 miles or so away in Florida and my parents were less than thrilled with me being engaged at the ripe old age of 23 (I get it now but it made for a less than happy time then) and so I pretty much dreaded every detail of the whole thing. Everything except picking a song. That was a pretty stress free task among everything else and while it still took me forever, I enjoyed it. We settled on Better Together by Jack Johnson and of course (in the pre-Pandora days) I had bought the CD. A CD we’d end up playing on weekend mornings as newlyweds while making breakfast and Jack singing to us about banana pancakes. And while I have no idea where that cd is now after a few moves, I’ll sometimes wake up on a Sunday 20 minutes or so after Ulysses to hear the Jack Johnson station on Pandora playing softly while he makes nothing other than banana pancakes. So on our 16th dating anniversary (we really don’t celebrate this, I just happened to remember the day before this year) I decided to do banana pancakes the legit way, from scratch, no box mix in sight and try things out with yeast. The answer is no, it’s not but I will tell you it makes for the absolutely most fluffy thick pancakes you’ll ever eat with just 10 minutes of extra rise time thanks to Fleischmann’s® RapidRise Yeast. The yeast just gets added to the dry ingredients, the milk just needs to be warmed slightly in the microwave and then everything gets mixed together like you would regular pancakes. After a quick cover and 10 minute rise time in a warm, draft-free place, the batter will be bubbly and ready for the griddle just like regular pancakes. Well, I’m pretty sure Jack Johnson would approve. After one bite of these fluffy, flavor-filled pancakes, I would surely write a song about them too. Try out these other “special” pancakes like apple carrot pancakes with maple cream cheese topping, these lovely almond persimmon pancakes or, these orange basil ricotta pancakes (their flavor is intoxicating!). If you’re looking for a higher protein pancake, don’t miss this easy recipe for protein pancakes or pumpkin protein pancakes either! 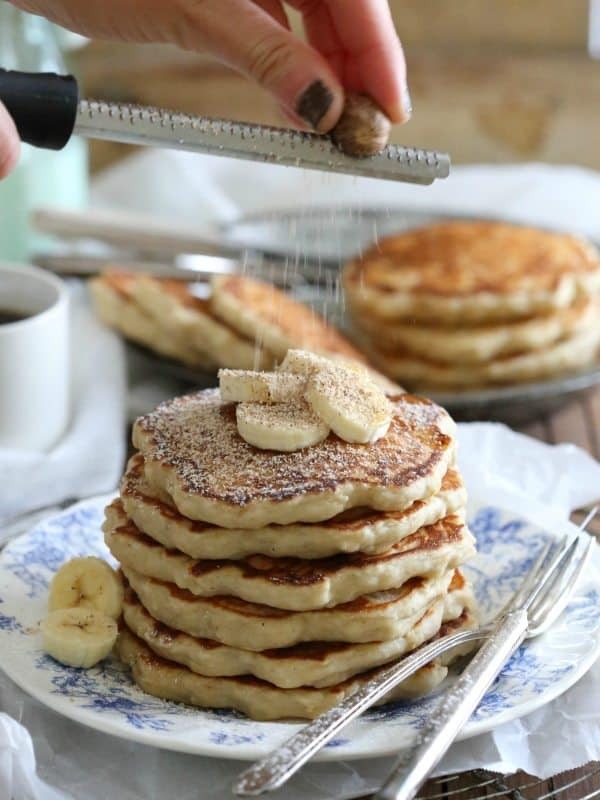 These banana nutmeg pancakes are made from scratch with yeast. Just 10 minutes of rising time makes these the fluffiest pancakes you'll ever eat. 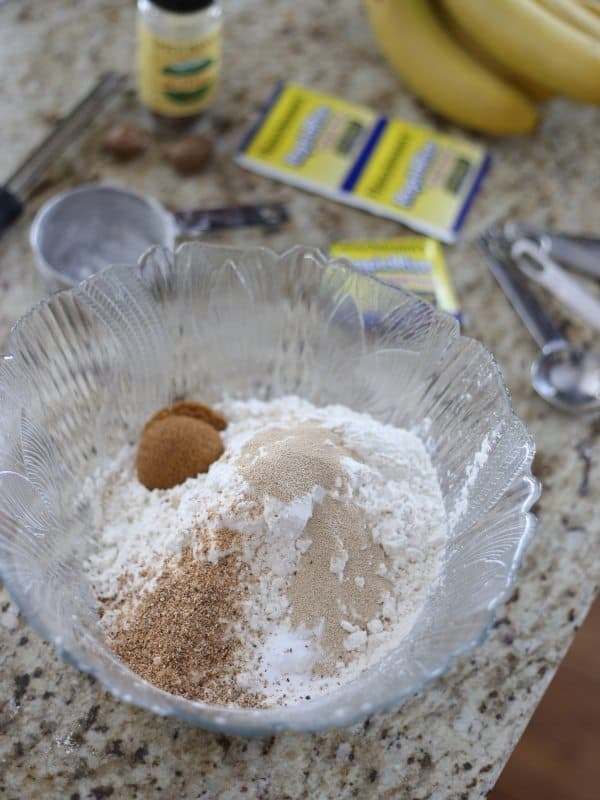 Combine flour, yeast, brown sugar, salt, baking soda and nutmeg in a large bowl and gently stir together. Combine the milk and coconut oil in a small bowl and microwave until warm (about 120-130 degrees). 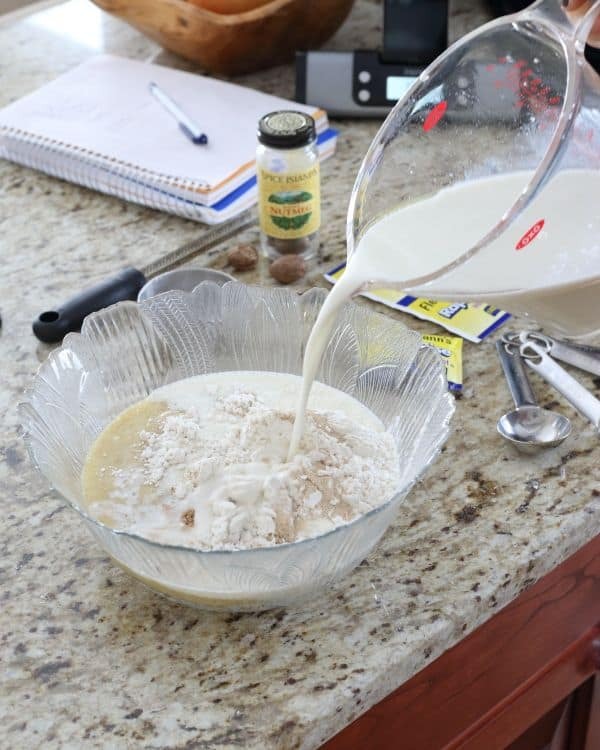 Add the egg, banana and milk mixture to the large bowl and stir until combined. 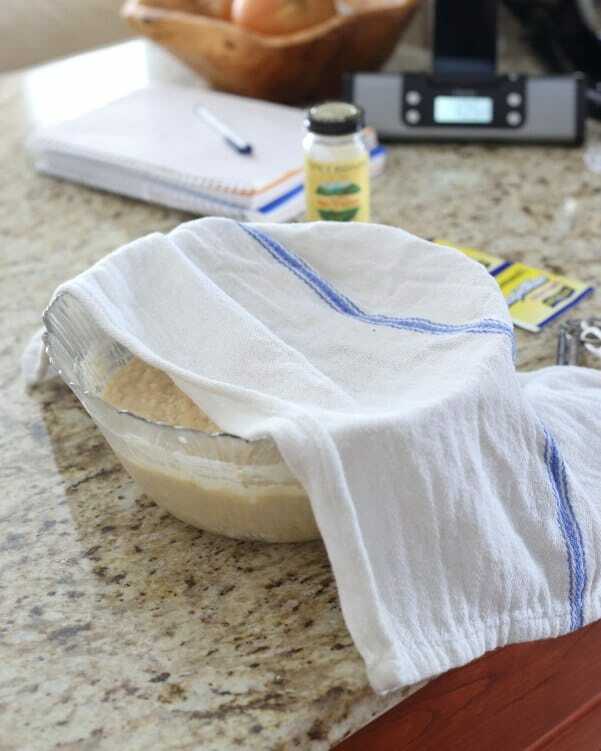 Cover the bowl with a towel or plastic wrap and set aside in a warm place for about 10 minutes until batter is bubbly. Meanwhile, heat a pancake griddle or skillet over medium heat and grease with more coconut oil. Stir batter again after the 10 minutes (it will be thick) and scoop out onto the hot, greased griddle in 1/4 cup measurements. Gently form into a circle, let cook for about 2 minutes until bubbling and set around edges, flip and cook another minute on the other side. Transfer to a plate or wire rack and continue with the remaining batter. Serve with sliced banana and freshly grated nutmeg on top. This is a sponsored conversation written by me on behalf of ACH. The opinions and text are all mine. What a great story! And I love that Jack Johnson song, too. It always manages to put me in a happy mood. 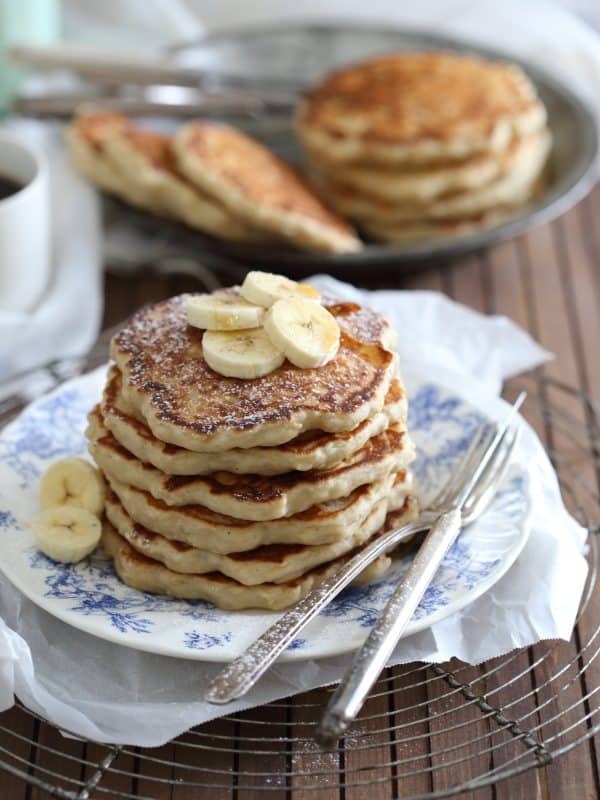 I love the thought of bananas and nutmeg together in a pancake. 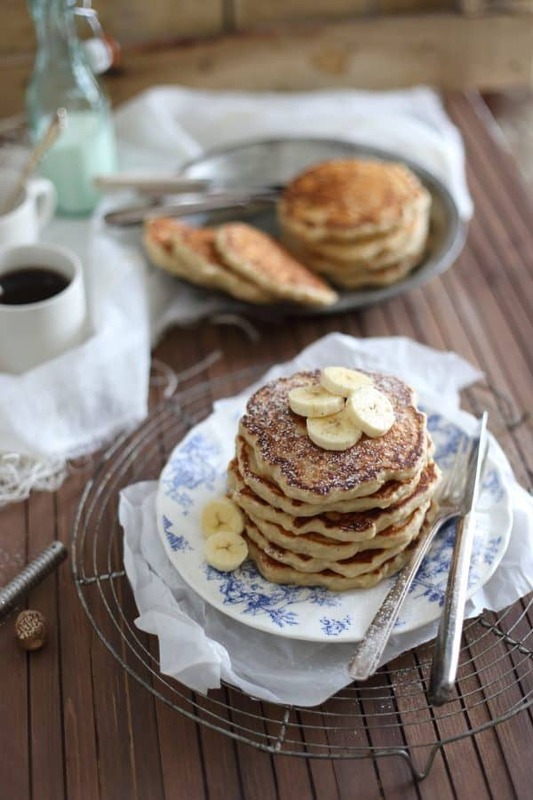 These pancakes I definitely will be making tomorrow morning, I am just loving the banana and nutmeg combination. Pinned!